This is a supple, rounded and satisfying wine with the ripe and spicy black fruit that is so typical of the Rhone. Medium to full bodied and with smooth tannins, this is a perfect match for cassolet or barbecued pork chops. Costières de Nîmes - Red French Wine Nîmes in the Southern Rhône, has a rich cultural heritage stretching back over 2000 years. The centre is still today dominated by a huge Roman amphitheatre (L'Arène). On the slopes and plateaux of the hills abutting the nearby river, are vineyards of Grenache Noir, Syrah and Mourvèdre which make the local Rhône wine called Costières de Nîmes. 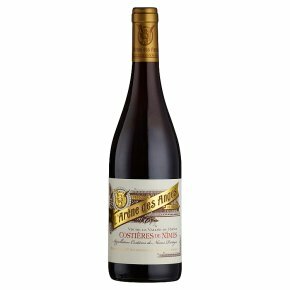 Brimming with red berry fruit, the palate is full-bodied and smooth, with a supple yet muscular texture flecked with rich Rhône spices building to a crackling, dynamic finish.